How many religious congregations are there in the United States? What’s the average size of U.S. churches? How many people go to church each Sunday? How many denominational groups are there in the United States? What are the 25 largest denominational groups? 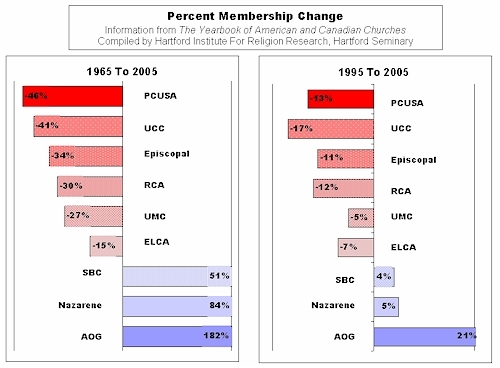 What denominations are gaining members and what denominations are losing members? How many seminaries are there in the United States? How many clergymen and women are there in the United States? How much do pastors make? What’s the average age of congregational leaders? Are clergymen and women healthy? Are more women enrolling in seminary? Are more women serving in churches today? Why are women dropping out of seminary, or ministry? Is there a salary gap between men and women clergy? Is there a relationship between church growth and youth involvement? Does having electric guitars cause church growth? Does having a website create a growing church? What’s the definition of a megachurch, and how many are there in the United States? How many churches use the Internet? How can I find a church in a certain town? Where can I find a dictionary of religion terms? Q: How many religious congregations are there in the United States? A: There is no official directory for all the congregations in the country, so sociologists of religion have to rely on statistical estimates extrapolated from surveys. These are often disputed, and to complicate matters, thousands of new churches open each year, while thousands of others close. Hartford Institute estimates there are roughly 350,000 religious congregations in the United States. This estimate relies on the RCMS 2010 religious congregations census. Of those, about 314,000 are Protestant and other Christian churches, and 24,000 are Catholic and Orthodox churches. Non-Christian religious congregations are estimated at about 12,000. Want to know more? Visit the Religious Congregations Membership Study (RCMS) - the 2010 US Religion Census report (PDF format) for more information. An alternative discussion of how to come up with a count of congregations in the U.S. can be found in Kirk Hadaway’s and Penny Marler’s article in the Journal for the Scientific Study of Religion, Volume 44, Number 3, September 2005, pp. 307-322. Q: What’s the size of U.S. churches? A: The median church in the U.S. has 75 regular participants in worship on Sunday mornings, according to the National Congregations Study (NCS) http://www.soc.duke.edu/natcong/ . Notice that researchers measured the median church size — the point at which half the churches are smaller and half the churches are larger — rather than the average (186 attenders reported by the USCLS survey http://www.uscongregations.org/charact-cong.htm ), which is larger due to the influence of very large churches. But while the United States has a large number of very small churches, most people attend larger churches. The National Congregations Study estimated that the smaller churches draw only 11 percent of those who attend worship. Meanwhile, 50 percent of churchgoers attended the largest 10% of congregations (350 regular participants and up). Want to know more? Check the websites for the National Congregations Study (NCS) at http://www.soc.duke.edu/natcong/ The US Congregational Life Survey (USCLS) website has statistics about congregations by religious traditions at http://www.uscongregations.org/ The Faith Communities Today national study of churches www.faithcommunitiestoday.org 2010 study also contains size and other congregational findings. Q: How many people go to church each Sunday? A: For years, the Gallup Research Organization has come up with a consistent figure — 40 percent of all Americans, or roughly 118 million people, who said they attended worship on the previous weekend. Recently, sociologists of religion have questioned that figure, saying Americans tend to exaggerate how often they attend. By actually counting the number of people who showed up at representative sample of churches, two researchers, Kirk Hadaway and Penny Marler found that only 20.4 percent of the population, or half the Gallup figure, attended church each weekend. As added proof for the accuracy of this smaller percentage of churchgoers, if 20.4% of Americans (approximately 63 million in 2010) attended the nation's 350,000 congregations weekly then the average attendance would be 180 people per congregation which is almost exactly the figure that numerous research studies have found. Q: How many denominational groups are there in the United States? A: This is a very tough question, because it depends on how a denomination is defined. There were 217 denominations listed in the 2006 Yearbook of American and Canadian Churches. But there may well be other groups that function as a denomination but do not regard themselves as such. The single largest religious group in the United States is the Roman Catholic Church, which had 67 million members in 2005. The Southern Baptist Convention, with 16 million members, was the largest of the Protestant denominations. The United Methodist Church was the second-largest Protestant denomination with 8 million members. In third and fourth spots were the Church of Jesus Christ of Latter-day Saints, known as the Mormon church, with 6 million member, and the Church of God in Christ, a predominantly black Pentecostal denomination, with 5.5 million members. However, since the RCMS 2010 study we now know that the grouping of nondenominational churches, if taken together, would be the second largest Protestant group in the country with over 35,000 independent or nondenominational churches representing more than 12,200,000 adherents. These nondenominational churches are present in every state and in 2,663 out of the total of 3,033 counties in the country, or 88% of the total. Largest 25 Denominations/Communions from the 2012 Yearbook of American and Canadian Churches. Total church membership reported in the 2012 Yearbook is 145,691,446 members, down 1.15 percent over 2011. 1. The Catholic Church 68,202,492, [ranked 1 in 2011] , down 0.44 percent. 2. Southern Baptist Convention 16,136,044, [ranked 2 in 2011] , down 0.15 percent. ** Since the 2010 census of nondenominational/independent congregations, we now know that this grouping of churches, if taken together, would be the second largest Protestant group in the country with over 35,000 congregations and over 12,200,000 adherents. 3. The United Methodist Church 7,679,850, [ranked 3 in 2011] , down 1.22 percent. 4. The Church of Jesus Christ of Latter-day Saints 6,157,238, [ranked 4 in 2011], up 1.62 percent. 5. The Church of God in Christ 5,499,875, [ranked 5 in 2011] , no update reported. 6. National Baptist Convention , U.S.A. , Inc. 5,197,512, [ranked 6 in 2011] , up 3.95 percent. 7. Evangelical Lutheran Church in America 4,274,855, [ranked 7 in 2011] , down 5.90 percent. 8. National Baptist Convention of America , Inc. 3,500,000, [ranked 8 in 2011] , no update reported. 9. Assemblies of God 3,030,944, [ranked 9 in 2011] , up 3.99 percent. 10. Presbyterian Church (U.S.A.) 2,675,873, [ranked 10 in 2011] , down 3.42 percent. 11. African Methodist Episcopal Church 2,500,000, [ranked 11 in 2011] , no update reported. 12. National Missionary Baptist Convention of America 2,500,000, [ranked 11 in 2011] , no update reported. 13. The Lutheran Church — Missouri Synod (LCMS) 2,278,586, [ranked 13 in 2011] , down 1.45 percent. 14. The Episcopal Church 1,951,907, [ranked 14 in 2011] , down 2.71 percent. 15. Pentecostal Assemblies of the World, Inc. 1,800,000, ranked 15 [ranked 17 in 2011] , up 20 percent. 16. Churches of Christ 1,639,495, [ranked 15 in 2011] , no update reported. 17. Greek Orthodox Archdiocese of America 1,500,000 , [ranked 16 in 2011] , no update reported. 18. The African Methodist Episcopal Zion Church 1,400,000, [ranked 18 in 2011] , no update reported. 19. American Baptist Churches in the U.S.A. 1,308,054, [ranked 19 in 2011] , down 0.19 percent. 20. Jehovah’s Witnesses 1,184,249, [ranked 20 in 2011] , up 1.85 percent. 21. Church of God ( Cleveland , Tennessee ) 1,074,047, [ranked 22 in 2011] , down 0.21 percent. 22. Christian Churches and Churches of Christ 1,071,616, [ranked 23 in 2011] , no update reported. 23. Seventh-day Adventist Church 1,060,386, [ranked 24 in 2011] , up 1.61 percent. 24. United Church of Christ 1,058,423, [ranked 21 in 2011], down 2.02 percent. 25. Progressive National Baptist Convention, Inc. 1,010,000, [ranked 25 in 2011 ], no update reported. 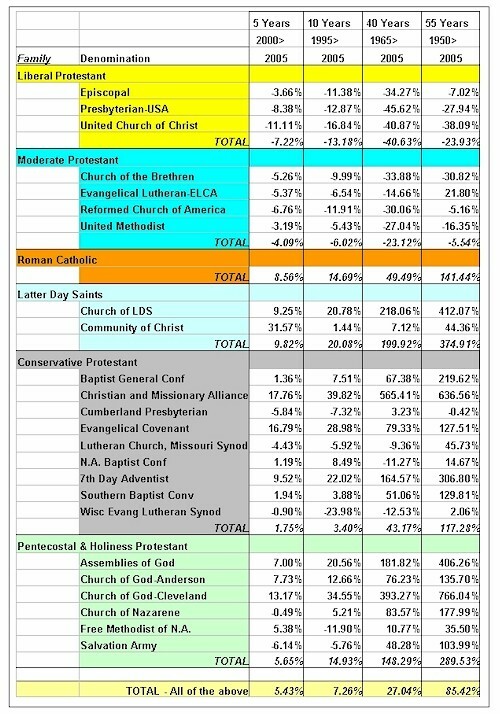 Total membership in top 25 churches: 145,691,446, down 1.15 percent. Membership figures reported in the 2012 Yearbook were collected by the churches in 2010 and reported to the Yearbook in 2011. Nine of the 25 largest churches did not report updated figures: the Church of God in Christ; the National Baptist Convention of America, Inc.; the African Methodist Episcopal Church; the National Missionary Baptist Convention of America; Churches of Christ; the Progressive National Baptist Convention, Inc.; the Greek Orthodox Archdiocese of America; the African Methodist Episcopal Zion Church; and Christian Churches and Churches of Christ. The 2012 Yearbook of American and Canadian Churches reports on 228 national church bodies. The Yearbook also includes a directory of 235 U.S. local and regional ecumenical bodies with program and contact information and provides listings of theological seminaries and bible schools, religious periodicals and guides to religious research including church archive listings. For more information, or to purchase a copy of the 2012 Yearbook, see www.yearbookofchurches.org. Q: What denominations are gaining members and what denominations are losing members? A: Mainline Protestant denominations continued to decline, according to the 2012 Yearbook of American and Canadian Churches. The United Methodist Church, the Evangelical Lutheran Church in America, the Presbyterian Church USA, and the United Church of Christ, all reported decreases in membership in 2011. For several years now, the Southern Baptist Convention, a conservative evangelical denomination, also showed a decrease. The Roman Catholic Church also reported a decrease of less than 1 percent. The growing denominations in 2011 were the Church of Jesus Christ of Latter-day Saints, the Assembles of God and several other Pentecostal groups; each reported a 2 percent growth. Sociologists have also found that larger evangelical Protestant churches appear to be growing, while smaller churches posted smaller growth. Based on data from the Faith Communities Today survey, evangelical churches with more than 1,000 people posted the largest gains over the past five years: 83 percent. Check out the Faith Communities Today surveys of congregations, http://www.faithcommunitiestoday.org You might also want to read How Strong is Denominational Identity? Q: Are U.S. churches multiracial? A: Sadly, no. Eleven o’clock Sunday morning continues to be the most segregated hour in America. But there are signs that a major change is underway. Our 2010 Faith Communities Today study of over 11,000 congregations found the percentage of multiracial congregations (based on the 20% or more minority criteria) had nearly doubled in the past decade to 13.7 percent. See our Huffington Post article on multiracial churches. A late 1990's study by sociologist Michael Emerson showed that "multiracial churches" (where 20 percent of members were of different racial groups from that congregation's majority race) accounted for between 7-8 percent of U.S. congregations. Our 2010 study indicated that the percent of multiracial congregations are increasing in all faith groupings. In Emerson's study, 5 percent of Protestant churches and 15 percent of Roman Catholic churches were multiracial, while in 2010, 12.5% of Protestant churches and 27% of other Christian churches (Catholic/Orthodox) were multiracial. Additionally, non-Christian congregations have considerable racial diversity. The 2010 survey found that 35 percent of congregations in faith traditions such as Bahai, Muslim, Sikh, and others were multiracial. The largest churches in the country also seem to have it easier. Large Catholic churches are significantly multiracial. Likewise, sociologist Scott Thumma found, in the 2005 “Megachurches Today” study, that megachurches have an multiracial advantage as well that balance. In his study, 35 percent of megachurches claimed to have 20 percent or more minorities. What’s more, 56 percent of megachurches said they were making an intentional effort to become multi-racial. Q: How many seminaries are there in the United States? A: The Association of Theological Schools reported 251 member schools in the United States and Canada in 2005. (In the U.S., there were 215.) The vast majority of those schools are accredited. Others are working toward accreditation. Of those schools, 141 were Protestant, 53 were non-denominational or inter-denominational, 54 were Roman Catholic, and three were Orthodox Christian. Enrollment in all 251 member schools was 81,302 in 2005. Want to know more? Go to the website for the Association of Theological Schools, http://www.ats.edu and click on the 2005/06 Annual Data Tables. Q: How many clergymen and women are there in the United States? A: The Yearbook of American and Canadian Churches www.yearbookofchurches.org reported that there were 600,000 clergy serving in various denominations in the United States. But that figure included retired clergy, chaplains in hospitals, prisons and the military, denominational executives, and ordained faculty at divinity schools and seminaries. The 600,000 figure did not include independent churches, not tied to a denomination. “There’s no way to know how many there are,” said Jackson Carroll, professor emeritus of religion and society at Duke Divinity School. In addition, the figures provided by the denominations to the Yearbook may not be that accurate, Carroll said. Nevertheless, at present it is the best figure to use. Want to know more? Read chapter 3 in Jackson Carroll’s God’s Potters: Pastoral Leadership and the Shaping of Congregations, (W.B. Eerdmans Publishing Co., 2006). The Pulpit and Pew website http://www.pulpitandpew.org/ has additional information about the characteristics and state of American clergy. Q: How much do pastors make? A: On average, an ordained Protestant pastor serving a small congregation received a median salary and housing package of $31,234, according to a study by sociologist Jackson Carroll. But there is a wide disparity in compensation between Protestant pastors serving small congregations and those serving medium and large congregations. For example, a Protestant pastor serving a congregation of more than 1,000 members received a median salary and housing package of $81,923. Considering that the vast majority of churches in the United States are small, the overall compensation package for Protestant pastors is low when compared with teachers and social workers. Roman Catholic priests earned less than Protestant pastors, in part because they have no family to support. Depending on the size of the parish, the median salary for Catholic priests runs between $21,000 and $26,095. Jewish rabbis earn more than Roman Catholic and Protestant pastors combined. Q: What’s the average age of congregational leaders? A: In the past few decades, men and women have been entering the ministry at older ages. Most had another career before going to seminary, and by the time they settled into the role of minister they tended to be middle-aged. In a recent study, the median age of senior or solo Protestant pastors was 51. The median age of senior or solo black pastors was 53. Roman Catholic priests are the oldest; their median age was 56. Associate pastors and those serving in non-church settings tended to be slightly younger. In a 2001 report by the U.S. Bureau of Labor Statistics the median age of full-time, graduate-educated minister was 45. Want to know more? Read chapter 3 in Jackson Carroll’s God’s Potters: Pastoral Leadership and the Shaping of Congregations, (W.B. Eerdmans Publishing Co., 2006) for more information. Q: Are clergymen and women healthy? A: Clergy tend to say they are in good shape. Of the nearly 900 pastors who participated in a national telephone survey for Pulpit & Pew http://www.pulpitandpew.org, a Lilly Endowment-funded research project, 76 percent said they enjoyed excellent or very good physical health. However, a follow up question found that 78 percent of clergy are either overweight (48 percent) or obese (30 percent). Though these figures are comparable to the U.S. population as a whole, they are nevertheless worrisome. As for handling stress, the Pulpit & Pew study found that pastors are doing a better job setting boundaries between work and personal time. Still, the average mainline pastor spent 50.8 hours a week at work, which was high in comparison with other managers and professionals. Want to know more? Read God’s Potters: Pastoral Leadership and the Shaping of Congregations, by Jackson Carroll, (W.B. Eerdmans Publishing Co., 2006). Q: Are more women enrolling in seminary? A: Women make up about a third of all seminary students, according to data from the Association of Theological Schools. That’s a big jump from 30 years ago when women made up less than a fifth of seminary students. Hartford Seminary Sociologist Adair Lummis suggests there are several reasons the increasing numbers of women. Social attitudes have changed and women are increasingly accepted in all the professions. In addition, several mainline denominations changed their rules to allow women to be ordained. Still, seminary remains by and large a male profession. Twice as many men as women completed the Masters in Divinity degree, the most popular of the programs, in 2005, according to ATS figures. Want to know more? Clergy Women: An Uphill Calling, by Barbara Brown Zikmund, Adair Lummis, and Patricia Mei Yin Chang, (Westminster John Knox Press, 1998) or see http://hirr.hartsem.edu/bookshelf/bookshelf_book_excerpts.html#women. Also, consult the website for the Association of Theological Schools, http://www.ats.edu. Explore the Annual Data Tables. Q: Are more women serving in churches today? A: Yes, but just how many is hard to say. Some denominations, such as the United Methodist Church and the Presbyterian Church USA keep accurate tabs on the number of women clergy. Others denominations, such as the Southern Baptist Convention, which officially does not permit women to serve as senior pastors, do not, (even though there are small numbers of women pastors in the SBC). Not surprisingly, the United Methodist Church, the nation’s second-largest Protestant denomination, had the largest number of clergywomen, 9,749, or 22 percent of its ordained clergy in 2006. But at that time sociologist Jackson Carroll said women make up a disproportionately large percentage of associate pastors, and may face unequal access to higher profile positions. A 2007 survey (PDF format) confirmed that finding but also showed that 31% of UMC churches had women as sole or senior clergy. The Faith Communities Today 2010 national survey of a fully representative, multi-faith sample of 11,000 American congregations found that 12% of all congregations in the United States had a female as their senior or sole ordained leader. For Oldline Protestant congregations this jumps to 24%, and for Evangelical congregations it drops to 9%. Want to know more? See our quick question - What percentage of pastors are female? Read Clergy Women: An Uphill Calling, by Barbara Brown Zikmund, Adair Lummis, and Patricia Mei Yin Chang, (Westminster John Knox Press, 1998) or see http://hirr.hartsem.edu/bookshelf/bookshelf_book_excerpts.html#women. Also, consult chapter 3 in Jackson Carroll’s God’s Potters: Pastoral Leadership and the Shaping of Congregations, (W.B. Eerdmans Publishing Co., 2006). Q: Why are women dropping out of seminary, or ministry? A: Schools and denominations don’t keep records on dropouts so it’s impossible to say with any accuracy how many women quit school or ministry. But Barbara Finlay, a sociologist at Texas A&M University, suggests some women opt out of ministry during their last year of school, realizing they will face uphill challenges to better-paying positions. Want to know more? Read Facing the Stained Glass Ceiling: Gender in a Protestant Seminary by Barbara Finlay (University Press of America, 2003, and Pastors in Transition: Why Clergy Leave Local Ministry by Dean Hoge and Jacqueline Wegner (W.B. Eerdmans, 2005). Also see Are more or less women entering seminaries today? Q: Is there a salary gap between men and women clergy? A: The salary gap that once existed between men and women clergy is narrowing. Whereas in 1991, women clergy earned on average 91 percent of men’s salaries in the same position, 10 years later that disparity had all but disappeared. Still, women face unequal access to senior pastor positions, which pay more. Sociologist Jackson Carroll found that among mainline clergy in their second decade of ministry, 70 percent of men were serving medium or large churches, compared to 37 percent of women. Want to know more? Read Clergy Women: An Uphill Calling, by Barbara Brown Zikmund, Adair Lummis, and Patricia Mei Yin Chang Also consult, chapter 3 in Jackson Carroll’s God’s Potters: Pastoral Leadership and the Shaping of Congregations, (W.B. Eerdmans Publishing Co., 2006). You might also want to read Is there a clergy shortage? Q: Is there a relationship between church growth and youth involvement? A: Sociologists of religion have found a correlation between church growth and youth involvement that is consistent across different types of churches, liberal moderate and conservative. In all these churches, the greater the youth involvement, the greater the church’s growth. Specifically, 58 percent of growing churches said the level of youth involvement was high. Researchers weren’t sure what came first, youth involvement or church growth. Do Church Growth Consultations Really Work? What do Lay People Want in Pastors? Does evangelism nurture church growth? Q. Does having a website create a growing church? A: Increased tech use is no guarantor of growth. More specifically, it is not a sure-fire panacea for struggling congregations. 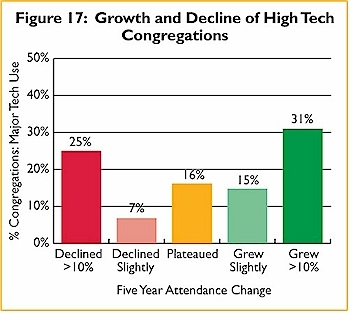 As David Roozen indicated in A Decade of Change, there is an odd high level of tech use in congregations in rapid decline as well as those rapidly growing, see Figure 17. Further analysis suggests this counter-intuitive finding is less a matter of religious leaders in declining congregations trying anything to survive, and more a factor of other circumstances at work, specifically conflict, that counteract the positive technological effect. An analysis of just those high tech congregations in serious decline indicated that over half experienced higher levels of conflict around member behavior, clergy leadership style, program priorities than those with less technology. Even more significant in understanding this tech-decline connection, two-thirds of this group had conflict around how worship was conducted in the past 5 years. In a third of the congregations, the situation resulted in people leaving. The embrace of technology, especially projection screens in worship, may factor into this conflict but it also may just be a marker for a larger effort to change the congregational culture. Tech use implies change. Conflict is frequently a consequence of change. The ability to constructively manage or channel conflict is frequently a key to the successful incorporation of technology into congregational life. More important than any direct correlation with congregational growth or decline, greater tech use is clearly one of several factors that nurture growth. When technology is combined with willingness to change, contemporary worship, a clear vision and sense of purpose, and younger members and families the growth potential of a faith community increases dramatically. All these variables correlate strongly with the most robust use of technology, and also result in a greater likelihood of growth. As Hadaway suggested in an earlier report on growing congregations entitled Facts on Growth, the embrace of technology “is part of a constellation of activities that congregations use to enhance their growth possibilities.” At the same time, without the intentional focus of using this technology in a ministerial strategy, the potential gain is wasted. The latent potential for enhancing ministry through technological means is significant. Read more of the latest research about these trends and the benefits of Internet technologies for the church. Q: What’s the definition of a megachurch, and how many are there in the United States? A: Megachurches are not all alike, but they do share some common features. Hartford Seminary Sociologist Scott Thumma who, with Warren Bird, compiled the 2011 “Megachurches Today” research report defines a megachurch as a congregation with at least 2,000 people attending each weekend. These churches tend to have a charismatic senior minister and an active array of social and outreach ministries seven days a week. As of 2012, there were roughly 1,600 Protestant churches in the United States with a weekly attendance of 2,000 people or more. That’s nearly 25% more than 2005, suggesting people continue to be receptive to this large-scale way of worshipping. The average megachurch had a Sunday attendance of 3,597. But not all megachurches are mega. The survey found that just 20 percent of megachurches had 5,000 people in attendance on a given Sunday. Want to know more? Read a detailed description of megachurches at: http://www.hirr.hartsem.edu/megachurch/megachurches.html Find out more about the number of megachurches and their characteristics in 2011. Q: Where are megachurches located? Q: How many Muslims are there in the United States? A: This is a hotly-debated issue with political overtones. There are currently several studies claiming between 1.5 and 6 million Muslims in the United States. Problem is, the U.S. Census is prohibited from asking about religious affiliation. To make up for the lack of solid numbers, different researchers have used different methodologies. A 2001 study titled “Mosque in America: A National Portrait,” reported 6 million Muslims in the United States. But Tom W. Smith of the National Opinion Research Center at the University of Chicago said those numbers were inflated and that in fact, there were 1.9 million Muslims in the United States. The recent 2010 Mosque study, The American Mosque 2011, indicates that the number of American mosques increased 74 percent since 2000 and that Islamic houses of worship are ethnically-diverse institutions led by officials who advocate positive civic engagement. from 1,209 mosques in 2000 to 2,106 in 2011. New York and California have the largest number of mosques, 257 and 246 mosques respectively. * The American mosque is a remarkably young institution; more than three-fourths (76%) of all existing mosques were established since 1980. * The number of mosques in urban areas is decreasing, while the number of mosques in suburban areas is increasing. In 2011, 28 percent of mosques were located in suburbs, up from 16 percent in 2000. * The number of mosques with large attendance has increased. In 2000 there were only 12% of mosques with attendance over 500 and in 2011 there were 18% with attendance over 500 people. More than 2% of American mosques can be classified as megachurches or megamosques which are defined as a congregation with attendance of 2000 or more people. * Mosques remain an extremely diverse religious institution. Only a tiny minority of mosques (3 percent) have just one ethnic group that attends that mosque. South Asians, Arab-Americans and African-Americans remain the dominant ethnic groups, but significant numbers of Somalis, West Africans and Iraqis now worship at mosques nationwide. * The conversion rate per mosque has remained steady over the past two decades. In 2011, the average number of converts per mosque was 15.3. In 2000 the average was 16.3 converts per mosque. The 2010 Faith Communities Today Interfaith Interaction report. Has Interfaith activity increased since 9-11? What do you know about your Interfaith Neighbor? Do American Muslims Want to be Involved in Public Life? Q: How many churches use the Internet? A: The 2010 Faith Communities Today (FACT2010) national survey of 11,077 congregations found that Internet technologies are being employed by a large majority of congregations. This is a dramatic difference from the roughly one third of congregations that embraced their use a decade ago. Combining the Faith Community Today survey findings with several other national survey results paints a dramatic picture of the rise of Internet technology within congregational life and the impact it is already having. 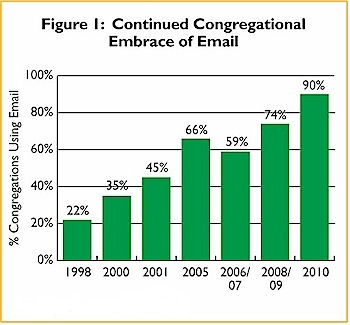 The use of email by religious groups from 2000 to 2010 more than doubled, rising from 35% to 90% of congregations, as Figure 1 shows. At the same time, congregational use of websites rose from 33 percent to 69 percent between the decennial surveys (Figure 2). 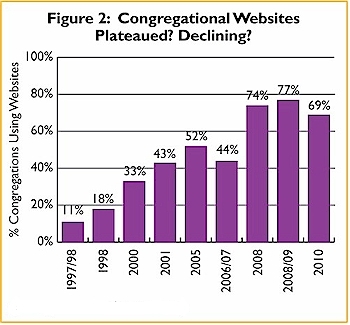 The 2010 figure of 69% is a decrease from the 2008 Faith Communities Today survey finding of 74% of congregations with websites. This decline may not indicate a retreat from technology but rather a shift in its use. Read more of the latest research about these trends and the benefits of Internet technologies for the church. Q: How can I find a church in a specific town? A: While there is not complete list of churches, whether by denomination or location, there are many church locators available that will assist you in finding a church in a specific location. We have compiled a list of Links to Church Locators that can assist you in your search. Q: Where can I find a dictionary of religion terms? A: An online dictionary of religious terms listed alphabetically is housed on the Association of Religion Data Archives (ARDA) website. Definitions include embedded links to archived studies and other resources housed on the ARDA website, when additional information is available. Another fine primer of religious terms, definitions and concepts can be found at the Religion Newswriters website.